LA FESTA DE LA MÚSICA REGALA UN GRAN CONCERT A LA VILA DE PERALADA. L’ESPECTACLE ‘I WANT TO BE A DIVA’ OMPLE DE GOM A GOM LA PLAÇA DE LA VILA, QUE HA ACOLLIT DURANT SETMANES EL CLÀSSIC DE L’ESTIU. MARC MONTSERRAT-DRUKKER HA ESTAT EL DIRECTOR ESCÈNIC D’UN CONCERT-ESPECTACLE QUE S’HA DESENVOLUPAT PER UNA GRAN PASSAREL·LA QUE OCUPAVA EL CENTRE DE LA PLAÇA. TAMBÉ S’HAN APROFITAT ANTICS BALCONS DE LA PLAÇA DES D’ON S’HAN FET DIVERSES INTERPRETACIONS PER PART DE LA SOPRANO, SARA BLANCH (ARTISTA RESIDENT DEL FESTIVAL) I DEL COR INFANTIL AMICS DE LA UNIÓ. A CADA EXTREM DE LA PASSAREL·LA HAN POSAT LA MÚSICA ELS MAGNÍFICS PIANISTES, ALBERT GUINOVART I JOSEP BUFORN. HA ESTAT UNA FESTA DE LA MÚSICA AMB UN GRAN NIVELL DAMUNT DE L’ESCENARI I AMB UNA EXCEL·LENT ACOLLIDA PER PART DEL PÚBLIC, QUI HA APLAUDIT AMB GRAN ENTUSIASME A LLARG DE TOT EL CONCERT. 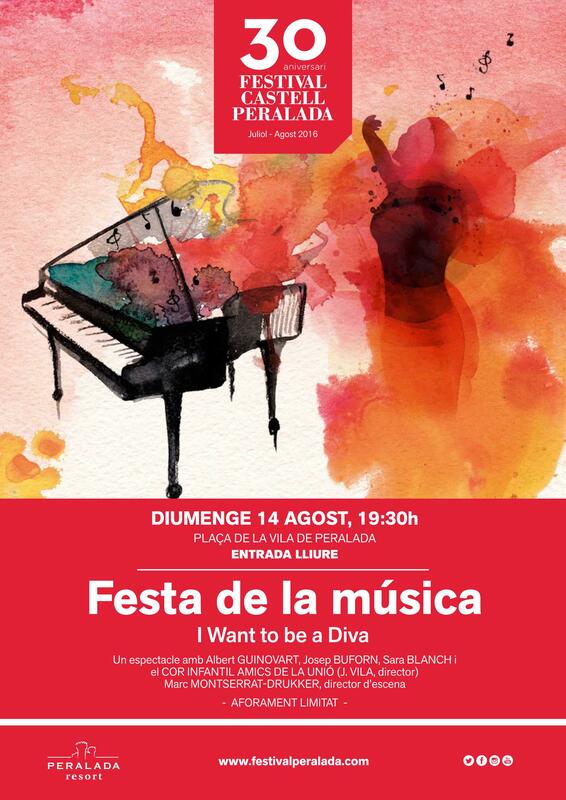 EL REPERTORI QUE S’HA INTERPRETAT HA ESTAT MOLT VARIAT AMB PECES COM ALLEGRO DE CONCIERTO D’ENRIQUE GRANADOS, SAPER VORRESTE, DE VERDI, DER HÖLLE RACHE, DE MOZART, I FEEL PRETTY, DE LEONARD BERSNSTEIN, LA GENIAL ÀRIA ‘LES OISEAUX DANS LA CHARMILLE‘ DE LES CONTES D’HOFFMANN D’OFFENBACH, EL DIVERTIT DUETTO BUFFO DI DUE GATTI, DE ROSSINI O PECES DEL MATEIX ALBERT GUINOVART ENTRE LES QUE NO HAN FALTAT COMPOSICIONS DE MAR I CEL COM ‘PER QUÈ HE PLORAT‘ O ‘HIMNE DEL PIRATES‘. EN TOTAL, 20 PECES, MÉS LA PROPINA QUE HAN OFERT DAVANT ELS LLARGS APLAUDIMENTS DEL PÚBLIC QUE UN COP ACABAT EL CONCERT S’HAN RESISTIT A AIXECAR-SE DE LA CADIRA. HA ESTAT UNA TARDA COMPLERTA EN LA QUAL EL FESTIVAL DE PERALADA HA VOLGUT TREURE LA MÚSICA AL CARRER PER ACOSTAR LA MÚSICA A TOTS ELS PÚBLICS I CELEBRAR TOTS PLEGATS EL 30È ANIVERSARI I DONAR LES GRÀCIES A LA VILA DE PERALADA PEL SEU GRAN ACOLLIMENT DURANT AQUESTES TRES DÈCADES.